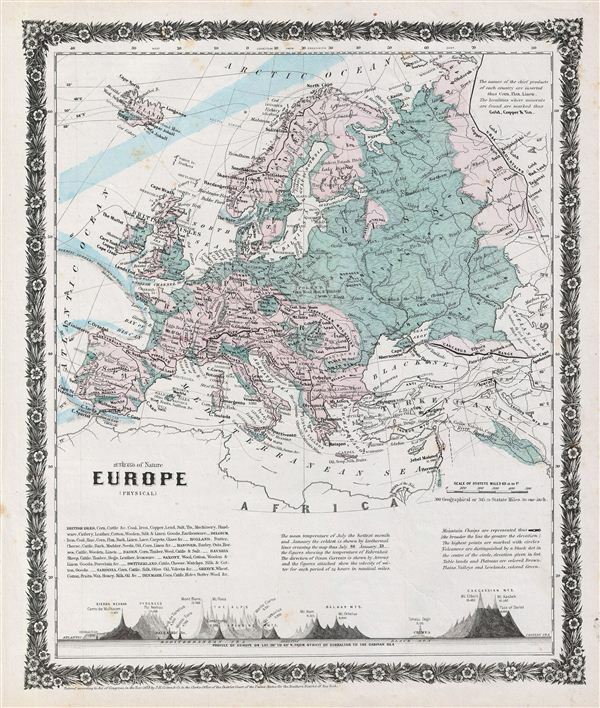 A rare example of Colton's 1858 physical map of europe. The map depicts the physical geography of europe from Norway and Sweden to the Mediterranean Sea and from Portugal to Russia and also covers Iceland. Although major cities are labeled, political distinctions are not. Color coded according to terrain, shows major cities, rivers, mountains, capes, oceans and ocean currents with mean temperatures marked. Chief products and minerals of each country are also marked. A land elevation profile of europe is shows at the bottom of the map. The top left and the bottom of the map, above the land elevation profile, contains small paragraphs with information about the markings on the map. This beautiful hand colored map is a copper plate engraving, featuring a delicate floral style border only used by Colton in this particular atlas. Dated and copyrighted to J. H. Colton, 1859, this map is by G. Woolworth Colton and the text is by Richard Swainson Fisher. Published from Colton's 172 William Street Office in New York City an issued as part of the1859 edition of Colton's Illustrated Cabinet Atlas and Descriptive Geography.